Air Power Park in Hampton is one of those little-known attractions most tourists rarely hear of. Fancy, it's not. In fact, it's rather old and run-down. (Sorry, I have to be honest.) But hey...it's free...which puts it in my "Cheap Family Vacation Hall of Fame." And aircraft/space lovers will enjoy it. Air Power Park is a little-known aviation attraction in Hampton, VA.
Lovingly run on a shoe-string by volunteers, the museum is housed in an old geodesic dome. Behind it is a small park with various military aircraft and missiles you can walk around. They also have a time capsule buried in the ground near the Jupiter rocket, which gave me an opportunity to explain what time capsules are to my kids. We were more interested in the old rockets that were used in NASA's space program at the Virginia Langley Research Center (they look like huge toys). There's also a space capsule, used in the Project Mercury program, that makes you feel really sympathetic to those poor astronauts. They must have felt like sardines in a can. To be honest, my kids were more interested in the dock overlooking the river and the playground than in the indoor exhibits (which are brief) and the aircraft. But on a nice day, you could bring a picnic, mosey around the aircraft, wave at the ducks drifting by on the river, and have the kids let off some steam playing astronaut on the playground. It's good for 30 minutes to an hour or so. 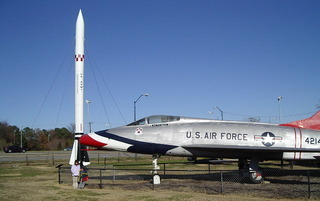 The Virginia Air and Space Museum is just a short drive away. If the words "free" and "military" are of interest to you, a mere 30 minutes will get you to a much larger and more exciting attraction: the US Army Transportation Museum in Newport News (go to my Cheap and Free Things to Do page and look under "Newport News" for details). 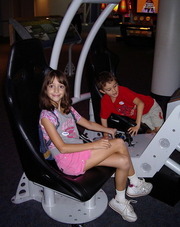 If money isn't an object, the Virginia Air & Space Museum (just a 10-15 minute drive away in Hampton) is far more interesting, both for adults and kids. But I'll say this about Air Power Park: You can't beat the price! And it's not far from the Coliseum Mall and two more free attractions-- Bass Pro Shop (where you can climb in tents, watch the fish in the aquarium, and try out the shooting arcade), and the Cousteau Society Museum in Hampton. Located at 413 West Mercury Blvd in Hampton, the Park is open daily, except for Thanksgiving, Christmas, and New Year's Day. For more information, call 757-727-1163. Their website is www.airpowerpark.com.